I have been crazy for maple lately. It all started when Zack and I went cake tasting for our wedding. We met with Lara of Fluffy Thoughts and Zack and I were blown away by how delicious her cakes were. I think she must have had us taste just about every flavor combination possible which made it very difficult for us to pick a favorite. In fact we could not settle on just one cake flavor or frosting because everything was so incredible; so each tier will be a different flavor cake with different frosting. Anyway, while we were there I tasted Lara's maple buttercream and I seriously wanted to just shovel it into my mouth with a spoon as fast as I could. I knew I needed to let Zack have a taste so he would agree we should have it with our cake, but it was hard to even give up a tiny taste....that is how good it was. Needless to say, we will be having maple buttercream on one of our tiers. 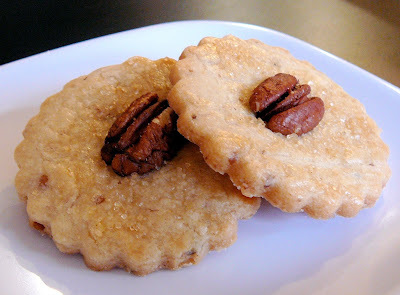 Ever since that day I have been craving maple; hence these cookies and my last post in which I made Maple Pecan Frosting. These cookies were delicious, easy to make, and quite cute. I highly recommend them. Into a medium bowl, sift flours and salt. Whisk in 1/2 cup chopped pecans, set aside. In the bowl of an electric mixer fitted with the paddle attachment, cream butter and granulated sugar on medium-high speed until smooth and light, about one minute. Add the maple syrup, egg yolk, and extract; beat on medium speed until well combined. On low speed, gradually add flour mixture, beating until just combined. Dough should be smooth and pliable. Flatten into a disk. Wrap in plastic; chill until firm, 1 1/2 hours or overnight. On a lightly floured work surface, roll out dough to 1/4 inch thick. 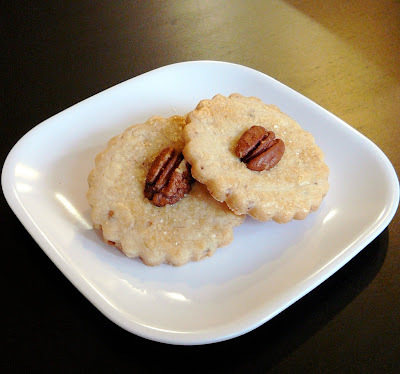 Cut out rounds using a two-inch cookie cutter; place one inch apart on prepared baking sheet. Brush tops with beaten egg; top centers with pecan half. Sprinkle the entire surface with turbinado sugar. Bake cookies, rotating baking sheet halfway through, until golden around the edges, 10 to 12 minutes. Transfer to a wire rack to cool. Store in airtight containers at room temperature up to four days. Makes approximately two dozen cookies. Cookie Dough Truffles and my first Give Away!